The theory of o-minimality made a huge mark in arithmetic geometry with Pila's unconditional proof of the Andre-Oort conjecture for products of modular curves. Since then, there has been a lot of work on questions of unlikely intersections, centering around the Zilber-Pink conjecture, and very recently leading to a proof of the Andre-Oort conjecture for all Shimura varieties of abelian type. 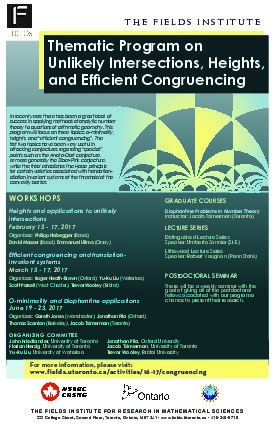 The aim of this workshop is to emphasize the recent applications to problems in unlikely intersections and functional transcendence. A valuation inequality for complex structure.